With experience in the HR and the workforce consulting space and your current role as the VP of Thought Leadership at Kelly Services, how has your work with content marketing evolved? What do you think about all the buzz? I’ve focused a lot of my time in the workforce consulting space, but basically I’m a professional services marketer. And even in the old days, professional services firms needed to produce great content to establish credibility – so it’s easy to see why I was an ‘early adopter’ of what we now call content marketing techniques. On the other hand, I’ve also won awards for creative interests like writing fiction, journalism, photography, short-film making. So I’ve always been around production and publishing in some form. But at another level, things have changed a lot. Google’s renewed focus on quality content means that the SEO industry is piling into content, because it’s the key element of search results. Similarly, it’s the fuel for any social strategy. And of course you can say the same for public relations and advertising. It really is a unique point in time that’s bringing about focus on content marketing right now. I think Lee’s book (Optimize) captures that perfectly – it really has been a convergence of what were previously disparate parts of marketing. By the way – an important point – a lot of the people who are kicking it in content marketing are not trained marketers. One of my biggest professional inspirations has been observing the success of people like Marcus Sheridan who had the good fortune of not having been to marketing school when he really needed to dig himself out of a hole. He built an incredible business by just getting in, doing and learning. All over the world, people like that are eating highly educated marketers’ lunches. It’s an amazing time. Your session “Get Video LIVE: Everything a Content Marketer Needs to Know About Succeeding with Video” is focused on increasing engagement by integrating video into marketing strategy. What are 3 of the primary takeaways from your Content Marketing World presentation that you think are most important? Everyone knows video is an increasingly important part of the mix for content marketers. But it’s also the type of content that’s most likely to be outsourced because people either don’t know how to do it, or feel they don’t have the internal resources to pull it off. Well, increasing numbers of companies are finding that actually they can drive a video strategy themselves. Everything about video content is changing. It’s hugely consumed on mobile devices. The platform ecosystem has become more diverse. New players are helping companies use video assets in a more programmed way against buyer stages. Video advertising is regularly reinventing itself. And despite all the technological advances – at its core, a successful video is still what it’s always been – a great story. This session is for everyone, but primarily for B2B marketers wanting to understand what other companies are doing right now with video, where the space is headed, and what resources they can tap into to build a coherent video strategy of their own. Content is both art and science with high demands on coordinating necessary planning, time and resources. This seems especially true for large, complex organizations with multiple players and diverse needs. What tools, software or services can you recommend for large enterprise companies that want to be more efficient and effective at using content to drive new business and engage their customers? People are always astonished when I talk about how we’re set up at Kelly for the amount of content we produce. We are very very lean. I’m a big believer in outsourcing, and our core internal skills are around communication – for interfacing with internal units and clients – production, scheduling and analytics. If I just had people like me, then I’d be grasping at every piece of technology out there trying to be better organized. But I have an amazing team who are so detail- and process-oriented that we manage with existing technologies. I love technology, and I’m very familiar with the tools in this space, some of which are great. But there’s also a reason things like spreadsheets and email still exist – they work. On the actual lead management side, obviously you need a good CRM and a lead-nurturing platform. On the front-end we have a common CMS (for the hundreds of websites that our ebusiness team administer), and a common site registration form that feeds into our lead nurturing process. For larger entities like ours, one of the hardest things is trying to retain commonality and simplicity in approach across all platforms. Goals can vary of course, but what are some of the essential “must have” measurements for content marketing success? We use the ‘big three’ groups of metrics that most people seem to focus on, plus some others that for one reason or another we think are meaningful. Tip: Measure absolutes, for sure, but don’t get hung up on them. More more useful and important is the trend, the growth in activity over time. What are 3 “secret” predictions that you have for the future and importance of brands and content marketing? 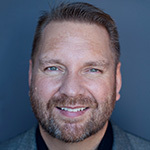 Form: Jay Baer said something along the lines of that in the future his written-word blog will be considered quaint, and thought about in the same way we think of the Amish today. I’ve come to think that day is coming much sooner than probably any of us feel prepared for. It’s anyone’s guess exactly what it looks like, but it’s going to be a lot more visual, mobile, entertaining and pithy. Brand: Online, I feel we’ve pretty much reached The Singularity. My email inbox looks like Justin Beiber’s Twitter stream. When five times more people are tweeting ‘Awesome Video!’ than are actually watching the video, something’s got to give. We’ve seen how publications like Time, Newsweek, Fortune have raced downstream with sensationalist content to try capture eyeballs. Their one competitor who didn’t, The Economist, is cleaning up and has never been more popular. Brands will be more important than ever, but will rise and fall faster than ever. If you want your brand to thrive – be yourself, be consistent, stand for something, and give value. Don’t cheapen yourself posting cat videos on your company Facebook page. Credibility: Marketers will need another 2 years to completely destroy the value of a published book. Until then, having a published book will continue to be seen as some form of credibility. A lot more people and companies are going to be pumping out books to burnish their credentials as experts in their niche. A lot of them will be terrible, but that will be OK because not many people will really read them. The concepts of personal branding, platforms, influence, etc – we’re just amoeba in the puddle right now. The Expertise Industry still has a long way to grow because people’s economic viability as an employee is coming to depend on it. Debrief complete. Well done Agent Wheatland. 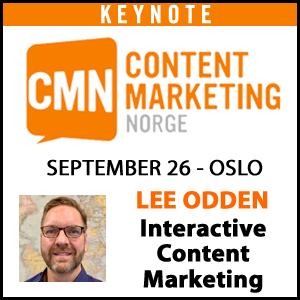 To get an ever deeper brief on the value of content marketing and video in particular, initiate your own mission to attend Content Marketing World on September 5th at 11:25am for Todd’s presentation: “Get Video LIVE: Everything a Content Marketer Needs to Know About Succeeding with Video“. 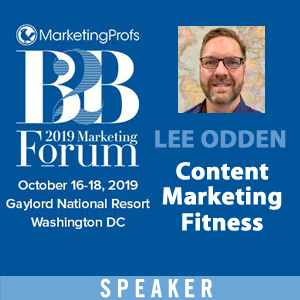 Also be sure to check out the TopRank session on the future of optimization: “Optimize and Socialize for Better Content Marketing” – Sept 6 – 3:00 pm (Content Creation & Optimization Track). Share your best in the comments and we’ll pick 3 winners this week to receive a free copy of “Optimize: How to Attract and Engage More Customers by Integrating SEO, Social Media and Content Marketing”. Our Content Marketing Secret Agent series is coming to a close and we have just two more interview left. Who will they be? Favorite Content Marketing Strategy – coming up with creative ways to get my clients to develop my content.